The students are exploring legal options over alleged discrimination, following protests on Wednesday. 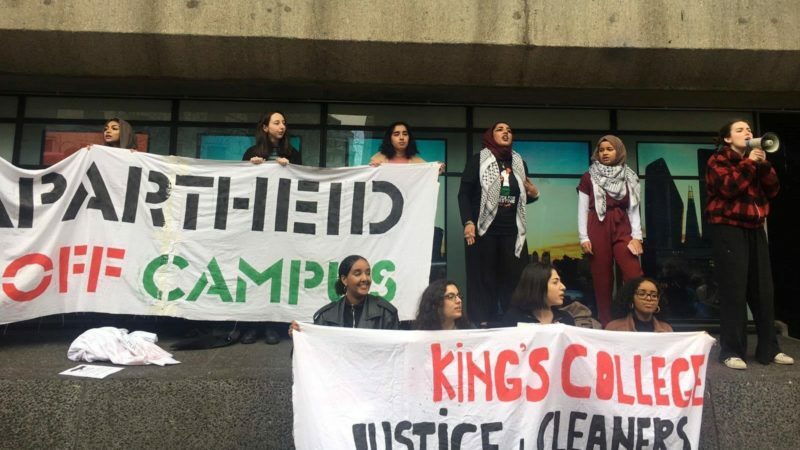 Activists are mounting a fierce challenge to King’s College London management, after some students deemed a ‘threat’ were denied access to the university during the Queen’s visit on Tuesday. Campaigners from the Justice for Cleaners campaign, the Palestine solidarity campaign and other students demonstrated at the University’s Strand campus on Wednesday. Over 100 people were estimated to have attended the demonstration organised with 24 hours’ notice. “From the little conversation we had with security manager – they had a list of prominent political activists. The activist said there had been: “No communication beforehand…people found out when they tried to scan their way in. They were told to come back at 2:30pm. “After enough people asked, we got told that we were a security threat because of the Queen’s visit, which is flattering. Students are now demanding a full apology and compensation, alongside a commitment to reduce ‘securitisation’ on campus. “When trying to scan my ID Card to access, as I do daily, it didn’t work. I went to reception to inform them of the issue. At this point I began to get nervous of being late to for my presentation. “The reception took my name and student number and asked me to wait a moment. The receptionist took a slip of paper out from next to her and on it I could see letter and numbers, presumably student names and ID numbers. After reading the note, they said plainly that I was not allowed on campus. Left Foot Forward can reveal the campaign are also considering potential legal routes, and are seeking advice. There is also an employment angle to a potential legal challenge: at least one worker alleges they could not access the campus for a shift in Bush House, where the Queen was visiting. These students must remember that the Queen is very, very, very old and somewhat wizened. A survivor of the onslaught of trips abroad, numerous banquets, changes of clothing, wearer of flower pot hats, gripping countless unwashed hands, excessive exposure of leather car seats, making speeches she has not written, keeping up with the many partners of her children but worst of all having a one to one with that awful woman who claims to be a prime minister! So students should understand that she finds people with banners very stressful!